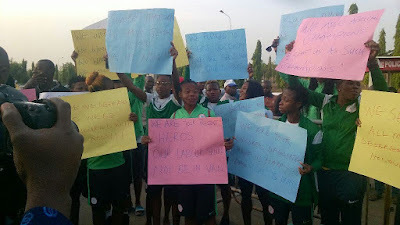 The players of Nigeria’s senior women’s national team, the Super Falcons, are staging a protest at the gates of the National Assembly to press for the payment of their unpaid bonuses and allowances. The new strategy by the protesting Falcons players is to directly get the attention of Nigeria president, Muhammadu Buhari. President Buhari is due at the National Assembly today to present the 2017 budget before the legislature, and will address both chambers of the assembly – the Senate and House of Representatives. The female footballers plan to continue their protest till the president arrives. That has not yielded the result they wanted, hence the decision for a protest at NASS. While each of the Falcons players are owed as must $16,500 for winning the tournament in Cameroon, they have only been paid a total sum of N600, 000 each (approximately $1, 900), which is a far cry of what is due. Aside bonuses that accrue from winning the 2016 AWCON, the players are also owed bonuses and allowances from the qualifiers leading up to the AWCON. Before now, the NFF and the sports ministry have made several promises to offset the bills, but they failed to keep their words, prompting the team to continue their protest in Abuja.